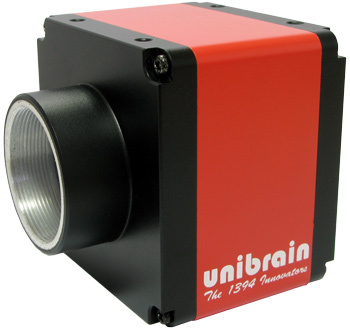 The new line up of Unibrain 1394b cameras, with a number of resolutions and frame rates to choose from, has made selecting the right camera for machine vision applications easy. Combined with Unibrain’s advanced, high performance 1394b driver stack and dual ports it offers an excellent combination for multi camera connectivity. The Fire-i 785c SXGA color camera incorporates a new 1/3″ Progressive Scan Sony CCD and achieves up to 30 fps at maximum resolution. By utilizing the IEEE 1394b interface that supports the IIDC protocol, users can transfer images to a host PC at speeds of up to 800 Mbps. Moreover, because multiple cameras can be connected in a daisy-chain configuration, users can enjoy the benefits of simplified operation in a multi-camera system. C-Mount, 1280 x 960 square pixels, 30 fps in YUV-422/RAW-8. Sony ICX-445AQ 1/3″ CCD, 3.75 x 3.75 um pixel size. Fast hardware or software asynchronous trigger. Built-in Real-time 3×3 Image Pre-Processing Filter. Bus synchronization and 32 MB image buffer. High Shock and Vibration Resistance. Compact (50 x 50 x 40 mm) and lightweight (160 gr). One 4.5m (15 feet) 9p to 9p screw lock 1394b cable. Unibrain 1394b ubCore drivers and Fire-i software and SDK. The Fire-i 785b SXGA monochrome camera incorporates a new 1/3″ Progressive Scan Sony CCD and achieves up to 30 fps at maximum resolution. The Fire-i 580b VGA monochrome camera incorporates a 1/3″ Progressive Scan Sony CCD and achieves up to 86 fps at maximum resolution.